Went up Lugnacoille on Monday morning, December 21st, the morning of the Winter Solstice. 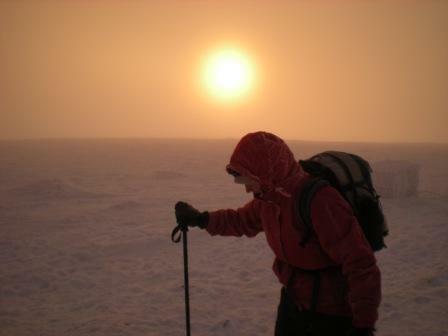 We started at 5.30am, in the darkness, with the intention of reaching the summit for the dawn. The weather was pretty good, a tiny bit foggy, and with snow on the ground (ankle deep for the most part, but up to knee-depth in some areas with the drifts). The hike up was pretty good, and we reached the summit in about 2 hours, with about 40 mins before the dawn (we were far too fast!). It was very cold waiting around for the sun, but when it came, it was fantastic. There was some cloud cover, but it blew away to reveal the morning sun. The descent was fine, took about 1.5 hours. Some ice along the way, but it was easy to pick out.